​Frequently, automobiles are purchased with tinted windows. These windows can be undesirable for one of more of a number of reasons including that they have been poorly installed, they are in bad condition, they are of an undesirable tint and they are not compliant with the law. ​Under these circumstances, the tinting films have to be removed and replaced with proper tinted film. Removing tinted film is a messy job because of the cement and it is not done properly, the window will look terrible and if re-tinting is desired, it can't be done properly if the previous film is not removed completely and the glass restored to it's pre-tinted condition. It is not necessary for us to be asked to reinstall tinting for us to remove old tinted film. 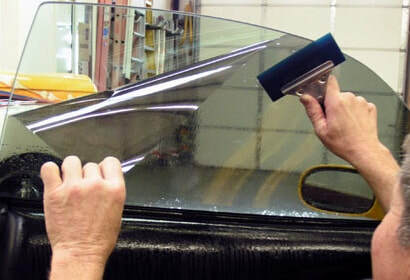 ​Removing dying tinting from windows is part of our expertise and we offer it as a service. There is no requirement that you be a customer for tinting for us to remove dying tinting. If you need tinted windows to be removed, we will quote a price for the service. We have the equipment and know how to do it properly. We certainly would like to offer re-tinting, done as described above. But it's not necessary. Removing tinting is service by itself. If you prefer to give it a try by yourself. There are five acceptable methods. If you call us, we will furnish you with printed instructions for you to give it a try. Call us in either case, you have us do it or you try it yourself.